A wooden table among the entire other furniture range is probably the most noticeable item. It is the need of every house hold, no matter how many do you already have in your furniture range, you would always need a couple of some smart and stylish wooden tables as side table or centre coffee table. As you all know that there have been a whole range of wooden pallet tables in our website. But due to the warm feedback we never feel like now we are done, we have enough of wood pallet recycled tables. That’s why we keep bringing the wood pallet tables inspirations repeatedly.Last time I had recycled a wood pallet coffee table with the glass top and I am using it as my centered coffee table that is the main feature of my lobby. And trust me its rustic look given by wood pallet has done a really great job in impressing my friends and acquaintances. 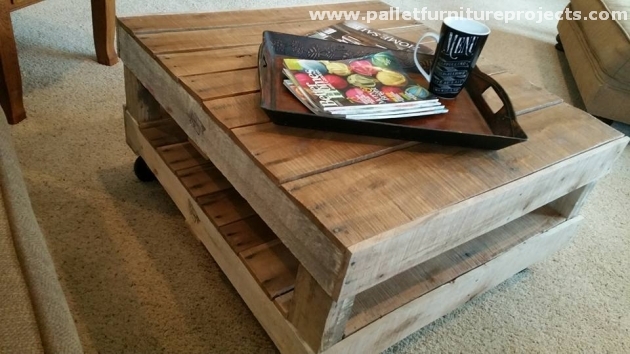 But today we are talking about a wood pallet recycled coffee table, we are going to keep it as simple as possible. And its design would be kind of suitable for all places. And you just don’t worry about the finances, keep it straight and simple and don’t go for any additional materials. 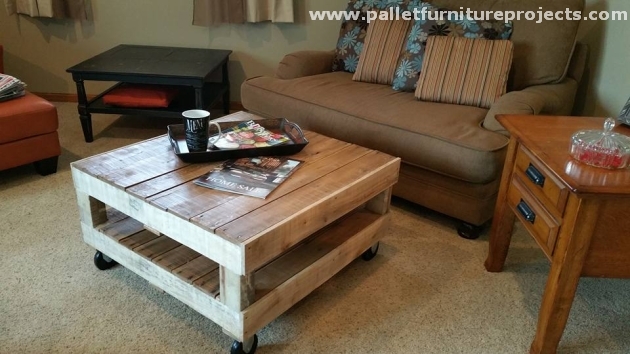 While having a distant look on the wood pallet table, we realize that this is a decent piece of wood pallet creation. We have kept its shape as simple as possible. The squared corners are very well rounded off by proper sanding. And finally we installed some giant metallic wheels on the base of this wood pallet recycled table, just to make it easily mobile for your ease. Use it inside your drawing room or lounge wherever you just feel like. Its rustic color would add much charm to the venue.